When people think of a wooden countertop, they generally think of the wide wooden panels placed side to side in a predictable pattern down the entire length of the countertop. This image could cause many people to dismiss the notion of obtaining a wooden countertop for their home because this design is kind of boring and may seem generic to many homeowners that are looking for a more unique countertop for their home. Wooden countertops can come in many different designs and colors so people that are interested in a beautiful countertop for their home may want to check out all of the different styles that wooden countertop manufacturers have to offer. Wooden countertops made out of wooden panels are some of the most common types of countertops purchased because they are what everyone thinks about when they consider a wooden countertop. There can be some variety in wooden countertops that are made out of wooden panels, such as using alternating colors of wood for each of the panels to create a dramatic stripe effect or placing the panels going from the front of the countertop towards the back in short panels instead of using the long panels that go from side to side. 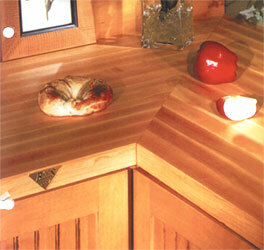 The wooden panels may even be placed diagonally across the countertop to create another unique design for a wooden countertop. Another interesting wooden countertop design is to use thin, one inch or two inch panels for the creation of the countertop. These countertops resemble the thin wooden boards that are often used for wooden flooring and are often used to match the flooring in the home for a clever home décor effect. Homeowners that have a country décor in their kitchen area or natural wood colored cabinets will find that these types of wooden countertops fit into their décor seamlessly. For a unique wooden countertop design, the homeowner may want to consider a wooden countertop with a checkerboard pattern inlaid in the countertop. This type of wooden countertop design uses two different colors of wood, generally one light and one dark, to create an alternating pattern across the entire surface of the countertop. The colors used can be traditional wood colors or wood stained in a more exotic color, such as red, green, black, or blue. There are many different wooden countertop designs that may be chosen for use in the kitchen of the home that are more unique than just plain wooden panels. These designs can further be enhanced by using more exotic types of wood for the countertop, such as cherry or pine, eliminating the traditional brown or tan gleam of the wood. By doing a little bit of research, the homeowner should be able to find a wooden countertop that is perfect for their needs and fits in with the décor of their home.